Plastic – a durable and inexpensive material – is an invention that has been a boost for humanity, used in everything from medical equipment to clothes. Under capitalism, however, the cheap material has allowed companies to make products more cheaply and therefore increase profits. The cost of mass producing such a durable, non-biodegradable material that is so cheap it can be tossed away is not a cost realised by the capitalist. The environment, unfortunately, pays the price, with 8.6 million tonnes of plastic dumped in the ocean every year. It has wound up in the stomach of more than half the world’s sea turtles and nearly all marine birds. The current projections by the World Economic Forum is that weight for weight, plastic will outweigh fish in the ocean by 2050. The BBC documentary series, Blue Planet II, centred its final episode (Ep.7), “Our Blue Planet”, on the catastrophic impact human activity has dealt to our planet and the creatures living in it. A mother albatross was seen unwittingly feeding her chicks plastic. Such was the level of pollutants in the water that dolphins were swimming in that the newborn calves were being exposed to the harmful plastics through the milk of their mother during feeding. The sheer noise of the major industries at sea – barges, boats, oil rigs digging – makes it difficult for marine animals who communicate through sound to hear or be heard. 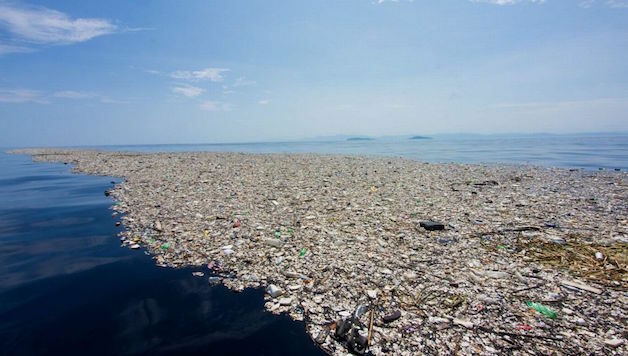 Such pollution is only adding to the damage being done through climate change, with CO2 leading to acidification in the oceans and for example, coral bleaching, which is killling coral reefs at an alarming rate. January 7 2018, Sydney experienced its hottest day since 1939, with distressing stories of mammals falling out of trees because of the heat, or abandoning their young to search for water or drench their fur to help cool down. Roads melted and people were encouraged to stay indoors. This cannot be written off as a random or a ‘freak’ weather extreme. Australia’s “ten hottest years” have occurred since 2005. On the same day as Sydney reached 47 degrees Celsius, in the US, temperatures in New Hampshire plummeted to -38 degrees Celsius. For the US, 2017 was a historic year for weather hazards, according to a report from the National Oceanic and Atmospheric Administration (NOAA), with 16 ‘severe’ weather events. There is an increasing number of hurricanes linked to storm surges because of increasing sea levels. The economic cost of these disasters this year is estimated at $306 billion. NOAA estimate total costs of $1.5 trillion since 1980 – this does not include other devastating impacts such as community displacement and the spreading of diseases. For example, today, the lived reality for most people in Puerto Rico is they still do not have electricity in their homes since Hurricane Maria struck in October 2017. The political establishment have been forced to acknowledge climate change, both by the pressure brought to bare on them by the environmental movement and the economic cost of the disasters their countries are forced to grapple with. But to tackle the warming of the climate crisis, that climate change presents, would bring them into conflict with powerful industries, and would threaten the system of production for profit they represent. While usually politicians will pay lip service to the seriousness of climate change, their actions speak otherwise. The less skillful, more obnoxious representatives of capitalism, for example Trump, flagrantly deny there is a problem and that climate change is just a “very, very expensive tax that will cost our companies”. All of this indicates that it is not simply enough to inform the politicians of what is necessary and hope they do the right thing. It is necessary to challenge them politically with a mass left, socialist movement that will put the needs of people and the planet first. To address the damaging effect of the oil and gas industries would require taking them out of private hands and doing away with their ‘right’ to shake down the planet for natural resources for their own greed. Socialism would mean that production is organised along the lines of what is needed by our planet and those that live on it. The current reality that capitalism offers is not acceptable.